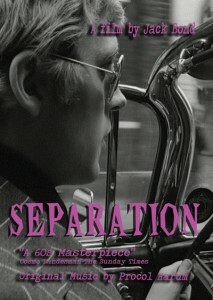 Separation is the 1967 film from director Jack Bond, starring (and influenced highly by) actress/activist Jane Arden, with an awesome soundtrack by Procol Harum. First, credit must be given to David Muir and Mark Boyle for their excellent cinematography. Although this film came out in the 60s of London, and definitely provides that “mod” atmosphere, the picture quality is beyond genius. Separation essentially was a product of Jane Arden’s mind. In her life, Arden was noted for her beliefs in feminism and anti-psychiatry. Therefore, it’s important to know what exactly these concepts represent before understanding this film. The movie follows Arden, as well as actors Ann Lynn, Ian Quarrier and David de Keyser. While Arden is the main character, we come across several women (such as Lynn) who could be considered Arden’s “alter-egos.” These egos essentially represent past, present and future in terms of a woman’s role in society. For example, we see Arden as a child, lover, mistress, wife, mother an elderly woman. This film portrays how much pressure is put on women in general to look, act and “be” a certain way in society, only to do what society wants them to (reproduce) and then be disposed of due to age. The psychiatric term “double bind” is a frequent theme in this film. Essentially, our culture in general tells women to embrace beauty, yet they often emphasize “freedom” when no freedom actually exists; we are “caught out in the contradictions.” At the end of the film she says, “I’m not ill. I’m trapped in this body. I look up at the sky and see beauty and freedom…But I’m trapped.” Her character knows she isn’t crazy, but this label is put on her simply because she can’t be true to herself while being able to please society at the same time. She’s trapped in a world of beauty and freedom that she can never fully attain as an individual. There are many layers to this movie (religion, government); way more than I could ever mention in this article. But I feel it’s important to recognize how deeply rooted the actors’ personal beliefs were in this film. Oddly, Arden killed herself in 1982, and according to Bond, Quarrier mysteriously disappeared from the face of the Earth. Also, the song that’s frequently played in the film is “Salad Days (are here again)” by Procol Harum. I wonder if this is a wordplay on the psychiatric term “word salad.” Just a thought.